My views on the subject are quite consistent. I don’t believe in War. I protested Viet Nam, and Iraq, although I supported limited intervention into Afghanistan (and look where THAT got us). I think it’s always better to try to work things out. So as a public service, I am reposting this picture. 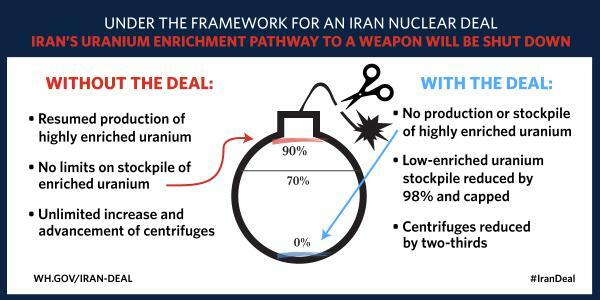 Because almost regardless of the details of the deal being worked out with Iran, compromises are better than war. I wish there were no such thing. Someone beat me to the song reference, so I will instead say that I am in total agreement with you. Thanks! You are a most agreeable sort! Springsteen is one of the few who make Mick Jagger look like he is at an afternoon tea while on stage with the Stones. Always a showman, but the thing about this clip is I think he believes the message. When is Netanyahu scheduled to campaign Iowa farmlands? As for Netanyahu, I think he’s going to use Fox News as his proxy in Iowa. I’ve used both the new editor and old editor, and gone back and forth with them. Overall, I prefer the old editor, and fail to understand how the new editor improves things. But it’s nothing to go to war over. Wait, what’s this post about? Does that mean it will stay away??? Awesome! Naw, it means that war seems to be a part of the human psyche and has no use for anyone who refuses to get violent. Ha! Although there have been some amazing “warriors” who, like yourself, did not believe in war. Sergeant York was a pacifist during WW1 and when he was required to lead a platoon against a impregnable German position, he spent the night before discussing it with the chaplain. He went, and in the face of all odds, “As soon as the machine guns opened fire on me, I began to exchange shots with them. There were over thirty of them in continuous action, and all I could do was touch the Germans off just as fast as I could. I was sharp shooting… All the time I kept yelling at them to come down. I didn’t want to kill any more than I had to. But it was they or I. And I was giving them the best I had.” In the end he and his little band of 7 remaining soldiers overran a huge German force. There is a memorial in Virginia to him. Then there is SunTzu who wrote the definitive book “The Art of War” some 2,500 years ago, who said that he didn’t believe in war and would only engage to get peace. So, to recap Elyse, it is you whiny peaceniks who always end up being the most ferocious and best warriors. Suit up soldier, as soon as they hear you’re a peacenik the military will be knocking on your door looking for your help. Ha! There is also a movie about Sgt. York starring Gary Cooper! I am pretty sure they won’t make a movie about me. War! Houh! Woah ooh woah ooh woah ooh, what is it good for — absolutely nothin’, say it again! “compromises are better than war”—I agree with you there. As always, I love the tags you use. Today’s tags gave me a good laugh. Thanks, Carrie. Those of us with kids, and those of us with brains agree! I’m having trouble using tags with the stupid beep beep boop or whatever format. I can’t find my normal ones because the drop menu only goes down to C! I still don’t use the new editor. I stubbornly refused to ever try it, so I still have easy access to the old one. Such a laggard I am. How do you access it? It has stopped offering me the classic. I HATE the new one! I just figured it out. Click on “My Sites” in the upper left corner so it does the drop down menu. Then click the option that says “Admin.” You’ll see if you “posts” if look around all the options (mostly for stats and stuff). Click on that and you’ll get the old menu. Voila!